A small village 16 km outside of Siem Reap has quickly become one of the most meaningful places in the world for us. To learn more visit: www.roots-cambodia.org. When nature is so unbelievably beautiful that you get excited about camping out in the wild. Travel here sustainability with G Adventures. 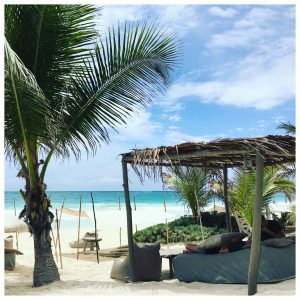 Two words: Nomade Tulum. More words: This is one of those magical places where architecture, interior, nature, food, service, and good vibes flow together so well that it becomes a struggle to leave the hotel and explore the surrounding area. This is one of those rare occasions where the hotel is the destination. Not our usual destination pick; yet the beautiful, historic landmarks and delicious, locally sourced food at The Bushmills Inn made up for the windy weather. By far our favorite weekend trip this year. Beirut is diverse, open-minded, and knows exactly how to make you feel welcome. Stay at Le Gray. Truly a trip of a lifetime. And contrary to popular belief, doable on a budget. Grab breakfast, lunch or dinner at Galápagos Deli in Puerto Ayora. Our most traveled-to destination and home away from home. This year’s favorite discovery: teatime at the Punch Room. Victoria Falls took our breathe away. Literally. We turned the corner to see this view and forgot to breathe for a second or two. Spend a night at the Cresta Sprayview Hotel for easy lodging.